In the short time being in Ocala, I have seen some beautiful country… Hills… big rolling hills with green pastures and tall live oaks dotting the landscape. The thoroughbred horse farms are every where you turn. Last year at the Derby 17 horses came from Ocala breeding and training programs. I am most impressed to see farms with their own race tracks with all the equipment to spare. Spring has arrived and so has the babies… cute and adorable out grazing with Mum and other mares with their babies. The future winners with no care in the world other than mother’s milk, naps and play time. Blessed in Sunny Florida with the horses Grand Amelia, Picabo and Mini Me. A peaceful sight to see them grazing and napping in their pastures under the gorgeous oak trees. Being in the Horse Capital of the World I have at my fingertips some amazing resources. I have found an Bio- Mechanical Riding Instructor, I can say its really works. Grand Amelia and I are busy learning and prepping for the local dressage schooling show. I call my three classes the vegetable soup group ( Introduction A, B, and C). Really basic walk and trot with come canter. What will I do in the summer when the heat comes… write the third book and blog..
Has been a long time since I blogged. So What has Martha been up to? Since our unpacking days are over… well sought of… we still need to hang pictures in the TV Room….. Does Martha still believe in her books… Absolutely FIRST helping VOCAL a 501c3 ! To encourage pet adoption, for all rescue animals they need a forever home. 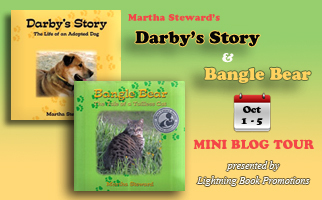 Books were Provided Darby’s Story and Bangle Bears for their Silent Auction… and the fun of attending . We have supported a great cause in our new local Community… VOCAL The 2018 FurBall was a HUGE Success VOCAL’s third annual FurBall on February 10, 2018 was our best FurBall yet! It was wonderful to see so many members of our community supporting change for homeless animals in our community. The theme of this year’s FurBall was “Love is a Four Legged Word,” and we surely felt the love for VOCAL’s mission. With help from our emcee, Evan Hecht and our amazing sponsors, including Dr. Maggie Bell and Darcy Bird, our presenting sponsors, we raised well above our goal of $105,000 with a whopping $140,000 raised for our clinic! Waking each day is a good day for my Kayaking Dog and I. We head up to the barns to check on the goats and llamas, then to the horses. We embrace the days that turn into seasons, the acorns are falling and the morning have a nice chill in the air. By noon it will hotter than you know what….. 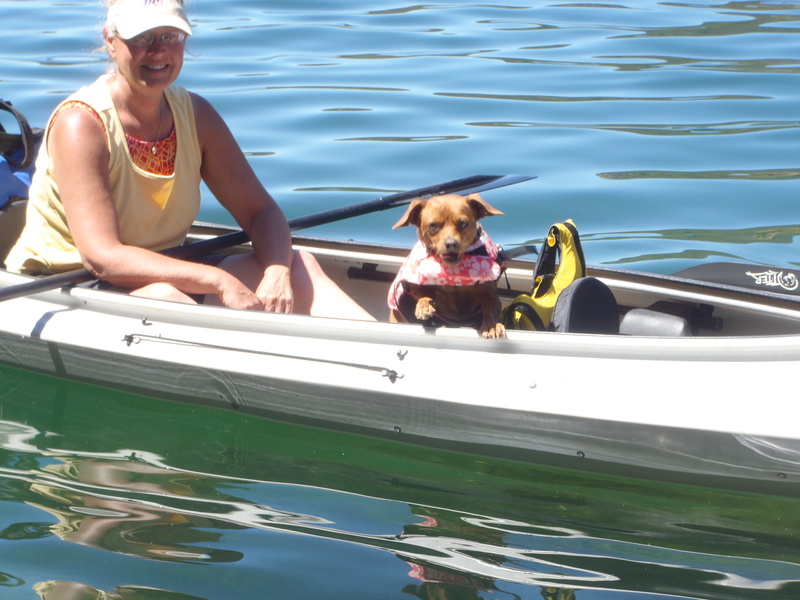 Embrace the day, be thankful and appreciate those smiles with your best my kayaking dog! Have you been looking for that horse property with deeded rights to a fishing lake, that suites both Wife and Hubbys’ interest? A family that enjoys the great outdoors, wife seeking move in ready horse barns with lush pastures, a place to park the horse trailer with plenty of room to turn around. The space to ride under a COVERED ARENA and the open arena. Have portable jumping fences available to set up your training course for you and the kids. Well better yet, a place to park your BASS BOAT, kayaks and canoes to explore one of Northern California best fishing holes: Clearlake. The Oldest natural lake with record-breaking weigh ins. ESPN comes back every year to air the Biggest Bass Fishing tournaments. Enjoy the quiet setting from your back deck over looking the horses grazing on 10 acres and the pleasure of riding under a 70×70 covered arena. Charming remodeled farm house in move in ready condition. All useable acreage, ready for horses with covered riding arena, newly renovated 10 stall picture perfect red and white barn with tackroom, a second large vintage barn great for hay storage, several additional covered stables and outbuildings for farm equipment and storage, brand new fencing through out ranch, & remodeled farmhouse! Home is approx. 1800sqft, 3bd/2bth and includes original hardwood, new tile in kitchen, new cabinetry, countertops, interior paint, & vinyl windows. Property even includes deeded beachrights to Clear Lake, home to some of CA’s best bass fishing ! 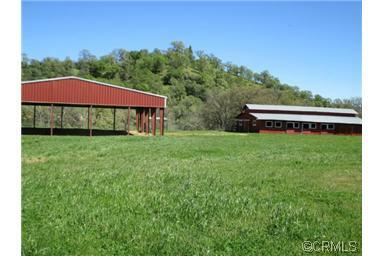 Easy ranch to access, located off of Hwy 29 and right near Vet, riding trails, Lakeport school district and downtown. Ranch has had a complete overhaul inside and out over the past year. Come and unload your horses! Seeking Property to Create an Animal Rescue…..
Have you ever thought about having your own animal rescue place? A place that is quiet and beautiful from the back deck of a MOVE IN READY house, with 10 stall barn with covered arena. 10 acres of pastures with tall oak trees and soft rolling hills? Over the years I have rescued pregnant mares, goats and sheep. Now it’s your turn to enjoy the experience of saving lives. A cherish experience of almost fifteen years, and incredible influence of my writing to share the rewards of rescuing animals. Here is your opportunity in Northern California, ten-acre farm with clean horse barn and paddocks, vintage old barn for small animals and hay. The farmhouse is remodeled. Waiting for a family to come and enjoy the life of riding ponies and raising your own fresh eggs. Have you ever thought about raising your kids in the country? I did and loved the experience. One of the best way to raise and development your own flock of sheep or herd of goats participate in your local agricultural program. UC Davis has extensions all over the California county side. One of the best part of waking to an early spring morning is to discover a set of new-born lamps. The air is sweet and the gentle loving of the Ewe toward her babies is a breath-taking experience. Between the kids and the family dog wooing and yawing over the magical moment of life. Here is your opportunity, ten-acre farm with clean horse barn and paddocks, vintage old barn for small animals and hay. The farmhouse is remodeled. Waiting for a family to come and enjoy the life of riding ponies and raising your own fresh eggs. The Cat Wisdom website, my first impression I love it, the book selection is delightful, plus the opportunity to win a giveaway. Books are and will always be a great Christmas gift. I can say the books on my shelf and shared with my son have brought warm memories of a good bedtime story. “Encouraging pet adoption through the pages”.